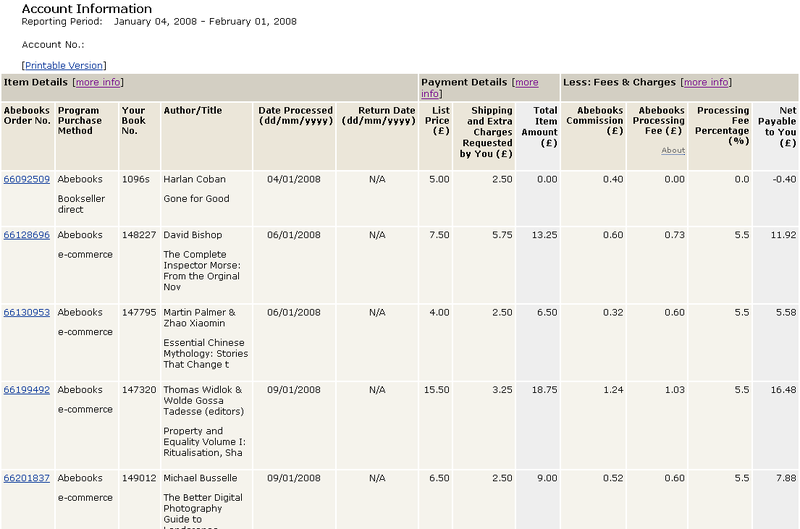 How and when do I receive my payments from AbeBooks? How can I check for which orders I have received payment? How can I print my weekly or monthly sales details? Your statement is a summary of the previous month's sales and payments. It contains the monthly total of your gross payable sales, offset against the monthly totals of commission, payment service fees and subscription fees charged. 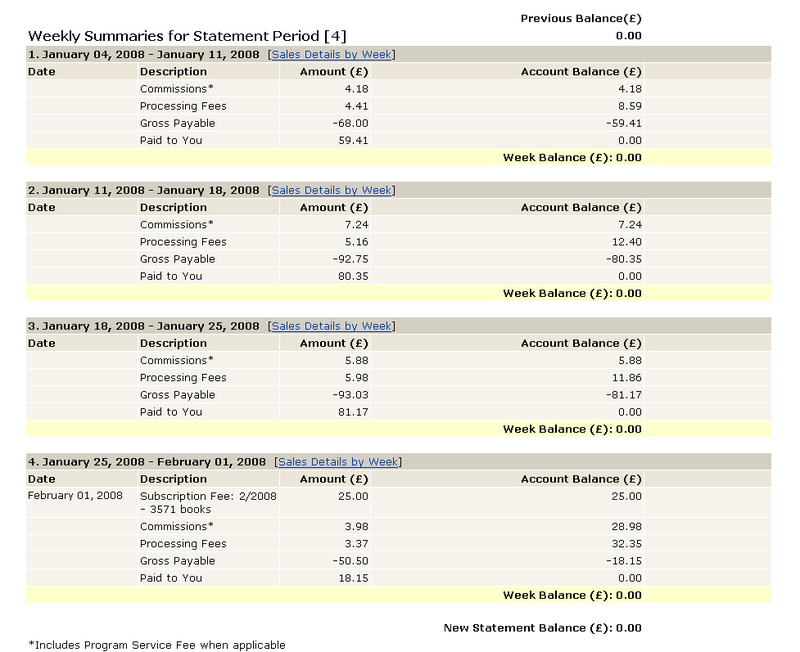 If you look at your weekly summaries, the totals together match the figure that you see on your monthly statement. Payment notification emails are advanced notice of your deposit; the funds will be transferred to your bank one week later, and then deposited by your bank within a few days. AbeBooks currently offers sellers located in Germany, who pay their fees in Euros, the ability to pay AbeBooks by direct debit. In order to comply with SEPA (Single Euro Payments Area) regulations, and so we may offer direct debit to other sellers within the European Union in the future, the following update has been implemented. Note: This information applies only to bank account information provided specifically for direct debit, where direct debit is offered to sellers (EU only). If you’ve provided your bank account information for EFT payment purposes only, the following information does not apply. As a part of your rights, you are entitled to a refund from your bank under the terms and conditions of your agreement with your bank. A refund must be claimed within 8 weeks starting from the date on which your account was debited. SEPA (Single Euro Payments Area) is a payment-integration initiative of the European Union for simplification of bank transfers denominated in euro. Beginning Feb 1, 2014, all euro Direct Debit payments between euro zone bank accounts must conform to SEPA regulations, including collection of Direct Debit Mandates and routing of payments using BIC and IBAN numbers. A Mandate is the authorization you provide to AbeBooks to direct debit your bank account. By providing AbeBooks with your debit account information, you have provided AbeBooks with a Direct Debit Mandate. SEPA regulations require that each Mandate is assigned a Mandate ID number. Where can I view my Mandate and Mandate ID? If you have provided a Mandate, a printable version, including your Mandate ID, is accessible through the ‘My Bank Account Information’ link in your Members Menu. Can I cancel my Direct Debit Mandate? If so, how? Does my Mandate ever expire? Your mandate expires 36 months after the last attempt to apply a charge to your account by direct debit, or 36 months after your mandate was created, whichever is later. To print a copy simply click on the Printable Version link. Remember that Bookseller Direct orders, where you process the payment, the commission will be included in the table but no payment will be made to you. If you are having difficulty understanding your online information or if you have any questions, please contact us.